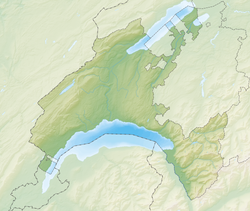 Nyon is a municipality in the destrict o Nyon in the canton o Vaud in Swisserland. It is locatit some 25 kilometers north east o Geneva's ceety centre, an syne the 1970s it haes acome pairt o the Geneva metropolitan aurie. It lees on the shores o Loch Geneva an is the seat o the destrict o Nyon. The toun haes (as o December 2015[update]) a population o 20,088. It is connectit tae the rest o Swisserland bi wey o the Route Suisse, the A1 Motorway an the railweys o the Arc Lémanique. Colonia Iulia Equestris in German, French and Italian in the online Historical Dictionary of Switzerland. Wikimedia Commons haes media relatit tae Nyon. Villa Sanluca, the boutique hotel in Nyon. A great place in an old mansion. This page wis last eeditit on 28 Februar 2019, at 23:46.